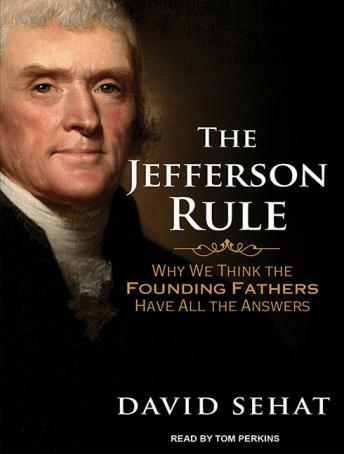 Beginning with the debate between Thomas Jefferson and Alexander Hamilton over the future of the nation and continuing through the Civil War, the New Deal, the Reagan Revolution, and Obama and the Tea Party, many pols have asked, 'What would the Founders do?' instead of 'What is the common good today?' Recently, both the Right and the Left have used the Founders to sort through such issues as voting rights, campaign finance, free speech, gun control, taxes, and war and peace. They have used an outdated context to make sense of contemporary concerns. This oversimplification obscures our real issues. From Jefferson to this very day we have looked to the eighteenth century to solve our problems, even though the Fathers themselves were a querulous and divided group who rarely agreed. Coming to terms with the past, David Sehat suggests, would be the start of a productive debate. And in this account, which is by turns informative, colorful, and witty, he shows us why.